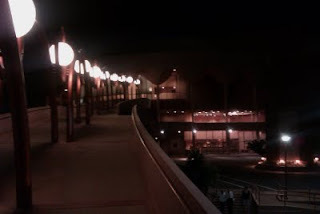 My friend and fellow MasterWorks (http://MasterWorksFestival.org) faculty member Matt Morris performed in Gammage Hall on the amazing campus of the Arizona State Sun Devils. I'll perform Paradise Lost (http://RichDrama.com/ParadiseLost) tomorrow in a different building as a part of the same International Double Reed Conference. Gammage Hall was designed by Frank Lloyd Wright for a group in Bangkok, but they never built it. ASU, one of the three largest universities in the US with about 60,000 students, bought the plans after Wright's death.